Want to jazz up your pasta dinner with a little color? 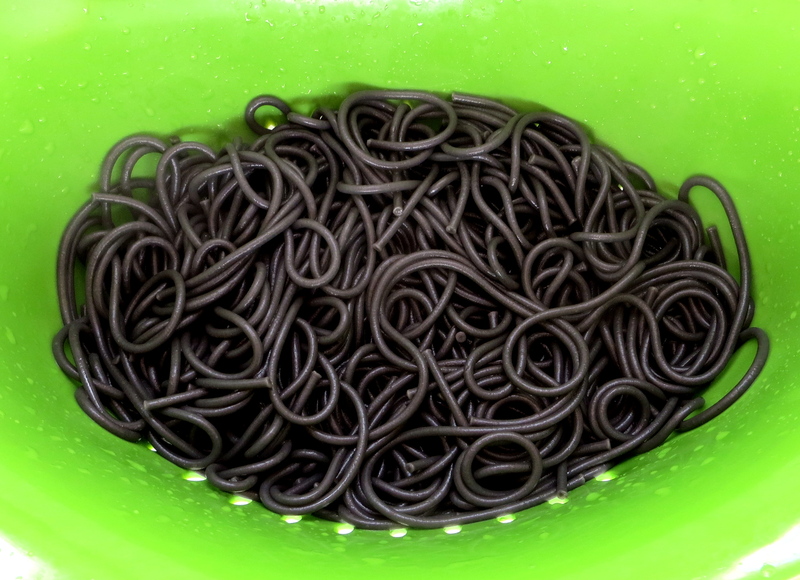 Try flavored or colored pasta like squid ink. While the thought of squid for some people may make them say – yuck- I know many of you are daring enough to try it. 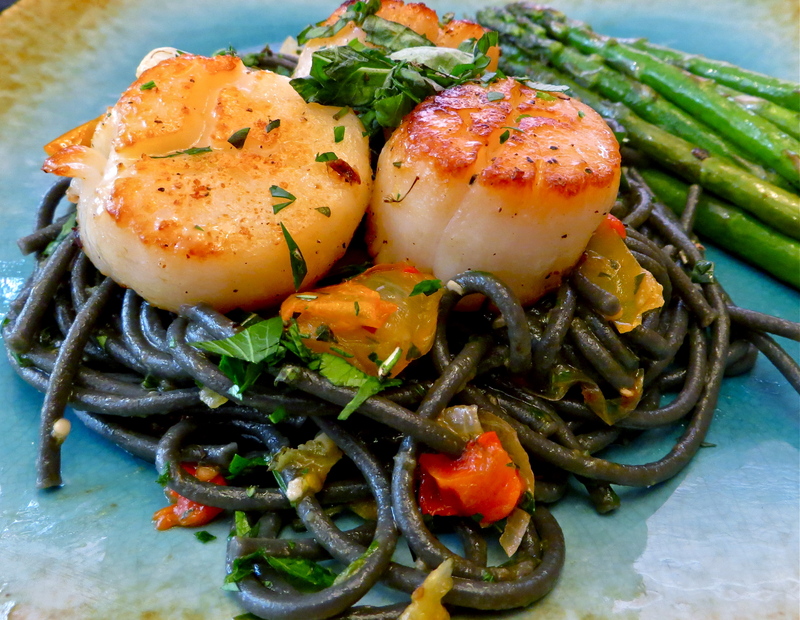 My video will show you just how easy it is to create this visually stimulating dish that combines squid ink pasta, scallops and fresh vegetables. Frankly the best part of the squid ink pasta is the deep, rich black color. Cephalopods like squid release the dark liquid as a defense, and the liquid is extracted from the ink sacs of the squid when they are being harvested. And for those who are scared of the flavor – fear not – squid ink pasta tastes very similar to wheat pasta with a subtle salty flavor. There typically is a small percentage of ink that’s added to the water and dough that creates the black color. Squid ink pasta and other types such as tomato, basil and spinach can be bought at gourmet grocery stores like Central Market for $9 and online at Marx Foods. In my last video and blog post I showed you step-by-step how to sear scallops in a pan like a professional. Now that you know it’s simple to cook scallops, making this dish will be easy to do when you get home from work. A great wine to pair with this dinner is a glass of Spanish Albariño. Rinse scallops, pat them really dry with paper towel and lightly season with salt and pepper. Pour one tablespoon olive oil into pan that’s reached medium-high heat and add scallops. Don’t move or flip them. Cook for two to three minutes until brown. Flip and cook an additional two minutes. Remove scallops from pan and let them rest. Boil pasta in unsalted water for 8 minutes. In the pan combine the remaining olive oil, garlic, red peppers, tomatoes, salt and pepper. Sauté for approximately six minutes on medium heat, then add basil, thyme and parsley and cook for an additional two minutes. Add scallops to the pan to warm them up. After draining the pasta, combine it with scallops and sauce. Posted in Recipes, Video and tagged dinner, pasta, recipe, scallops, seafood, squid, squid ink pasta, video. Bookmark the permalink. Mmmmm good job! And I know how good it tastes. Thanks for your help in perfecting the dish. Delicious! And the pasta looks gorgeous. Thanks for sharing. Great video! Thanks for all the yummy ideas! So good! Thanks for posting!